The CFC is currently accepting applications for the next CBC Actors Conservatory, the only full-time comprehensive professional on-camera acting program in Canada. In the weeks leading up to the application deadline (March 30, 2018), we have been highlighting Actors Conservatory alumni through featured Q&As discussing their craft and their development since their time at the CFC. Our final 2018 CBC Actors Conservatory Spotlight focuses on Jade Hassouné, 2012 Actors alumnus and star of supernatural teen drama Shadowhunters. 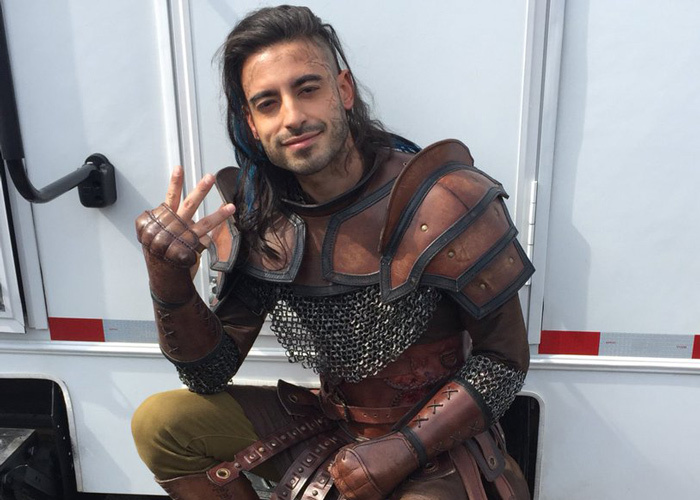 In addition to playing Meliorn on that much-loved Freeform series (airing on Netflix Canada weekly in Canada), he is also a producer and actor on That’s My DJ, a webseries created by Cineplex Entertainment Film Program alumna D.W. Waterson and also starring fellow Actors Conservatory alumna Emily Piggford. What were your biggest takeaways from your time in the Actors Conservatory? There are two things that remained with me [after the Actors Conservatory]. First, it gave me an inner knowing, a confidence that I was ready for this business. That what I dreamed, I was already accomplishing. It was a launching pad for my belief that this IS my career. The second thing [that remained with me] was the people and connections. I met friends and colleagues that I will know my whole life, who are all extremely talented and proactive in creating their own content and who want to manifest projects into reality. Jade on the set of Shadowhunters Season 3. How have you applied what you learned in the Conservatory to your work on beloved series like Shadowhunters and That’s My DJ? For Shadowhunters, it was more of an auditioning/preparation/on set process and practice. I used tactics that would enhance my experience in preparation, as well as execution of my scenes (mixed with what I've always done). For That's My DJ, there were no auditions. I was given a role that we workshopped through table reads and scene study like [what we had done] at the CFC. It was collaborating with writers and the director to focus the vision into a cohesive map of the project. Then there was the raising of the money online, which allowed me to discover more of a producer approach to a project. What’s next for you? Any plans to collaborate with more CFC alumni? But yes I do have plans to continue reaching out to my talented friends/alumni, as we all have amazing resources available to us. We are very fortunate to have each other. WANT TO APPLY FOR THE 2018 CBC ACTORS CONSERVATORY? HERE’S HOW. PLEASE NOTE THAT APPLICATIONS ARE DUE BY MARCH 30, 2018. Actors: Apply by March 30!